Dear fellow Greeks Alexander the great died yesterday in Babylon the year 323 B.C. Alexander was only 32 years old. he was a great man he was a military commander at the age of 18 two years later Alexander became king at age 20. He’s 5 foot 7 inches and was born in 356 B.C. His dads was king Philip the second. 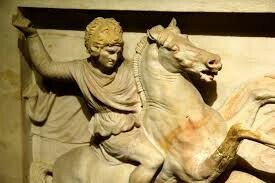 his father went to battle when Alexander was only 16 aslo Alexander tamed a horse when he was a kid and named it bucephalus his best friend and second in command was general Hephaestus. He was supposedly related to Hercules. Also he was best known for conjuring much much of Asia and Europe.